The Atom Renaissance. Windows RT is history – the new entry-level version of the Yoga-series uses Intel's Bay Trail and a full version of Windows 8.1 64-bit. More usage scenarios and more performance also result in a significant drop of the battery runtimes. The 11" Lenovo Yoga 2 is a decent, adaptable ultrabook that's pretty pleasant to use, provided you don't ask too much of it. Considering its portable design, it's a shame that Lenovo hasn't offered a more impressive battery life: you may find that this hampers its ability to perform tasks. HP or Lenovo: Which Windows PC Convertible Is Head of the Class? The HP Pavilion x360 and Lenovo Yoga 2. Both are 11-inch convertible Windows PCs with a 360-degree hinge design, meaning that you can fold the keyboard back under the display to use it as a tablet. The Pavilion x360 starts at $400, and the Yoga 2 starts at $489. If you’re in the market for a new laptop, and like the idea of hybrid design, the Lenovo Yoga 2 is a good choice. It’s a little more expensive than the HP Pavilion x360, but you’ll get more for the money. 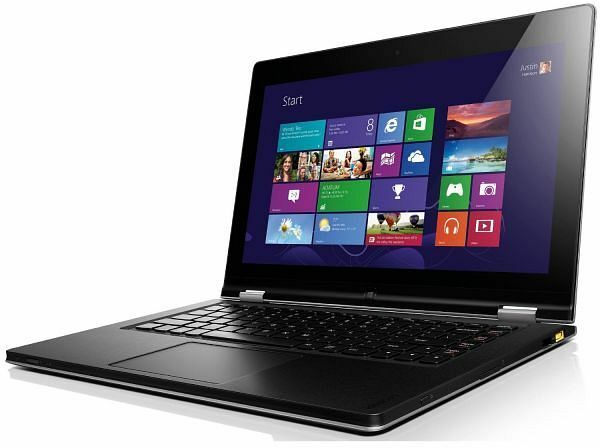 The 11 inch Lenovo Yoga 2 is one of the most interesting affordable 2-in-1s available right now. It sports the convertible form factor and a sleek and solid body, an IPS touchscreen and a fanless Intel platform able to handle everyday activities well enough. Just don't get the base version that comes with a slow HDD (or upgrade it if you do) and don't expect too much in terms of battery life. Model: The term Yoga in the Lenovo IdeaPad Yoga 2 11 inch highlights the flexibility of the device to be flipped and folded in 4 different forms, which are laptop, tent, stand and tablet mode. Elegantly designed, the laptop has a metallic look with a grey finish highlighted with the black tile keyboard. Contours and lines are kept simplistic allowing for simplicity to shine brightest. The 11.6 inch WideView display features an HD resolution, uses IPS technology and supports 10-point touch input. The Windows 8.1 64 bit system comes with an Intel Quad Core Pentium N3520 processor, 4 GB DDR3L RAM, Intel HD Graphics 4200 GPU and 500 GB SSHD with integrated 8 GB NAND flash. Users will definitely notice the responsiveness of the device and appreciate the overall weight of just 1.3 kg. Audio quality is good with HD Audio stereo speakers tuned with Dolby Home Theatre v4. Other features include Bluetooth 4.0, dual array microphone, a USB 3.0 port, a USB 2.0 port, a 2-in-1 card reader and a micro-HDMI output. The Lenovo IdeaPad Yoga 2 11 inch prides itself on good battery life provided by a 4-cell battery which enables up to 6 hours of FHD video playback. N3520: Soc with an integrated quad core Atom processor clocked at 2.2 - 2.4 GHz and an Intel HD Graphics GPU.» Further information can be found in our Comparison of Mobile Processsors. 69.14%: This rating is bad. Most notebooks are better rated. This is not a recommendation for purchase.